Have you ever flipped through a foodie magazine and come across a page you want to take a bite out of?! Maybe it's just me or maybe I was just hungry. I sometimes find a few extra minutes in the mornings to pick up a magazine while I eat my breakfast before work, which is how I came across this recipe I'm going to share with you today. 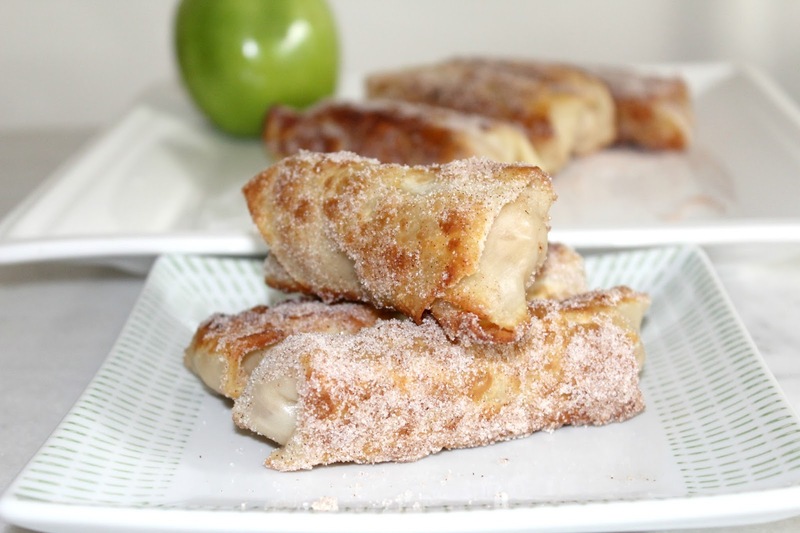 I was looking through the September/October issue of Eating Well and these apple pie rolls caught my eye. I don't post very many dessert recipes on here, but this one looked to good not to. A warm, sugar coated, crispy outer shell filled with sweet apple cinnamon filling — who can say no to that? The good news is that by using these egg roll wrappers instead of a pie shell, cuts the calories in half. That's a win in my book. The only thing I was missing was something to dip them in. But then again I thought they were good enough on their own. However, if you put a scoop of vanilla ice cream on top I wouldn't complain. In fact, I'm going to make sure I have some handy the next time I make this recipe. 1. Heat butter in a large skillet over medium high heat until it starts to brown slightly. 2. Add diced apples, 2 tablespoons sugar, 1 teaspoon cinnamon, nutmeg & salt. Cook stirring occasionally until apples soften. Add flour and cook for 1 more minute. 3. Remove from heat and stir in lemon juice. 4. Place an egg roll wrapper on a clean surface with once corner facing you. Lightly brush the edges with water. Place about 1/3 cup of the filling towards the edge of the wrapper. Fold the corner face you over the filling, then fold both sides of the wrapper over the filling and roll. Repeat with the remaining wrappers and filling. 5. Combine the remaining cinnamon and sugar in a shallow bowl. 6. Add coconut oil to a skillet over medium high heat until simmering. 7. Add the rolls, turning frequently until browned on all sides. 8. Once the rolls are browned, immediately dredge the warm rolls in the cinnamon-sugar mixture. *Add more cinnamon and sugar to coat the rolls if needed. Serve with a scoop of vanilla ice cream on top. This sounds delicious, saving to make later! They were really good! Hope you get a chance to make them! Thanks! Hope you get to try them out!